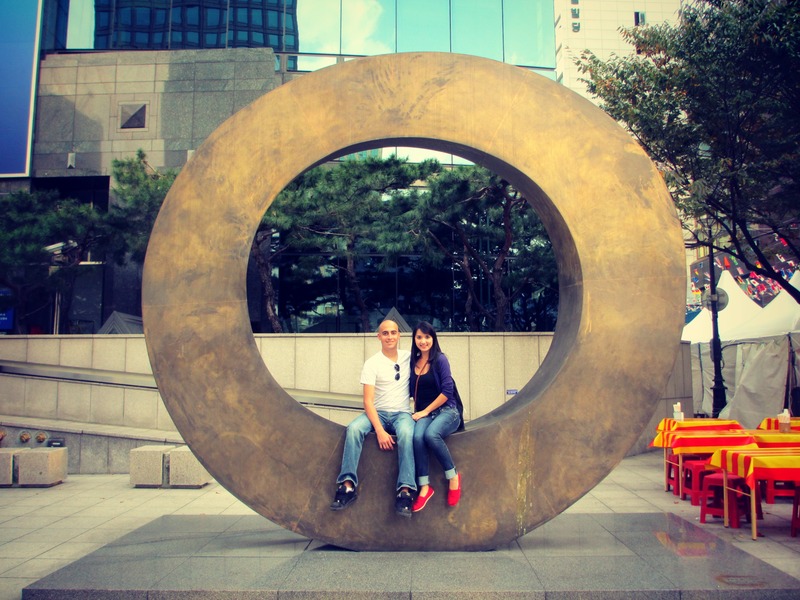 This was our second trip to Seoul, primarily for the purpose of winter clothes shopping. We ended up getting lost – a lot. We stayed in the Myeong-dong area, a nice section of Seoul always bustling with people. (Well, are there any areas of Seoul that aren’t?) The Hotel Irene was a pretty nice stay, minus the smoky after smell. It was a convenient location with access to the Cheonggyecheon Stream, Myeong-dong shopping area, and cathedral. We spent a great deal of the weekend looking for shopping areas on the stream, particularly the Dongdaemun Market. We finally reached it on Sunday, and got to experience the outrageous outdoor shopping district with great enthusiasm. 2000₩ shirts/dresses, 5000₩ for a pack of socks, and rows and rows of cheap shoes! There were many detours along the way, which helped us familiarize ourselves with the area. Another trip is in the works for November, when we hope to stock up on warm coats, scarves, hats, and thermals. Inadvertently walking into the Performance Arts Festival at Cheonggye Plaza, and seeing costumed people walking on stilts and old people dancing. Dinner at the Copacabana Grill – top sirloin is so delicious! Cold cinnamoned pineapples are also tasty. Walking the streets of Itaewon and feeling like we were in America for a night. Discovering that Naver Maps works better than Google Maps in Seoul, except we can’t read Korean. Tasting the best garlic bread we’ve ever had at Rimini Pasta & Pizza. Waffles and Häagen-Dazs ice cream at Cafe Palazzo, near the hotel. Morning bus to Seoul. Get energized with edamame and juice! We sat next to a girl and her iPad phone. The restroom was a bit odd. The tub sits halfway behind a wall. I don’t know how big people get in and out. Care for some… MisDo coffee? Hehe. Zinger burger, original and crispy – all for meee! Who says you can’t get privacy in public? While looking for the Cheonggyecheon, we come across people walking on stilts. Some kind of Arts festival! Clint wouldn’t have anything to do with the big, scary head. So I had to take a picture by myself. There’s the “I’m so drunk I need to sleep it off” corner. Tiramisu and red velvet cupcakes to over-stuff our bellies before bed time. Clint used his invisible sword and sliced this building in half. The authorities were so impressed, they gave him a medal and sent us on our way. Weeee! Forever 21! Clint is looking particularly hesitant because he just realized it’s 4 stories of squealing Kim. Lunch break before more shopping damage! The absolute best garlic bread in the history of garlic breads. So we ate on the 3F at Rimini’s, then went to eat on the 2F for pizza. Two-hour lunch breaks are normal, right? And finally, Dongdaemun Market. We barely even scratched the surface. Will return in November for the rest. $2 shirts and $.50 socks? Yes, please! Snack before heading home. That’s Häagen-Dazs ice cream! Traveling in luxury, next to a very intoxicated Korean gentleman. Made it! The entrance to the Cheonggyecheon Stream. So many people walking around and enjoying a beautiful Sunday. Probably wasn’t supposed to sit on this… Oops! The sides streets of the Cheonggyecheon. This is possibly the saddest person in the happiest scene ever. The Cheonggyecheon Stream is 8.4 km (5.2 miles) long! “What do I do with my hands?” Haha! Scene from below, on the stream. This is as good a place to nap as any! International flags along the side roads of the Cheonggyecheon Stream. Walking along the Cheonggyecheon Stream. Koreans and their efficient and clever ways. We somehow detoured into the inside/outdoor cafeteria of Korea. Found the Halloween shop. Some racist masks up in here! Time for the Brazilian steak dinner we’ve been waiting for at Copacabana Gril! Mmmm. Top sirloin, why you so good? Grill masters and gauchos hard at work. Earn that money! Tried cinnamon pineapple for the first time. Warm, not so good. Cold, delicious! — at Copacabana Grill. Itaewon night life reminds me of 6th St, but hilly, and Korean. Aligato, arigato – you know, same thing. Korea and its alcohol-serving trucks on the streets of Itaewon. By george, we found our first cupcakes in Korea! simple, yet effective. A lot of times it’s hard to get that “perfect balance” between usability and visual appearance. I must say you have done a great job with this. Also, the blog loads very fast for me on Safari. Superb Blog!